Mashapaug Pond is a large urban pond with a long and complicated history. Part of the Lower Pawtuxet River Watershed, the pond connects to a series of parks and freshwater bodies before draining into Narragansett Bay. [Mashapaug and watershed map] Today, a web of streets and pavement border the pond, including Niantic Avenue, Crescent Street, Reservoir Avenue, Elmwood Avenue, and Huntington Avenue. The area looks and feels enormously different than it did just fifty years ago, according to our oral history storytellers. Some of these people spent their youths near the pond and some came to their connection later in life, but all possess unique memories of this gem, which to many is a hidden secret of South Providence. This is a common refrain today, but the pond used to play a more prominent role in community life. After all, the history of Mashapaug is the history of the people of this area. Indigenous peoples created an important cultural center at Mashapaug, before European colonization and Indians continued to live along its shores well into the 20th century. As Providence grew, Mashapaug became settled by many homes and businesses. By 1900, ice houses and factories ringed the pond. These businesses were soon dwarfed by the Gorham Manufacturing Company’s sprawling factory, the center of fine silverwork in New England and a major local employer. Industrialists considered urban ponds a convenient place for disposing waste and Mashapaug was no exception. This was one of the many reasons why Gorham chose to build its state-of-the-art plant in 1890 on Mashapaug Pond. After diminished consumer demand led to drastic changes at Gorham, Textron purchased the failing company in 1967. Now Textron, the city of Providence, the state Department of Environmental Management, and local activists are working hard to clean up the former Gorham site and improve conditions in the cove area of the pond. In 2001, the first part of the area to be remediated and redeveloped was unveiled: Mashapaug Commons Plaza, formerly home to Stop & Shop and presently the site of Work Out World, Renaissance Church, and Popeyes. Alvarez High School sits next to the Plaza on land formerly occupied by Gorham. Industry and development also have transformed other areas around Mashapaug. 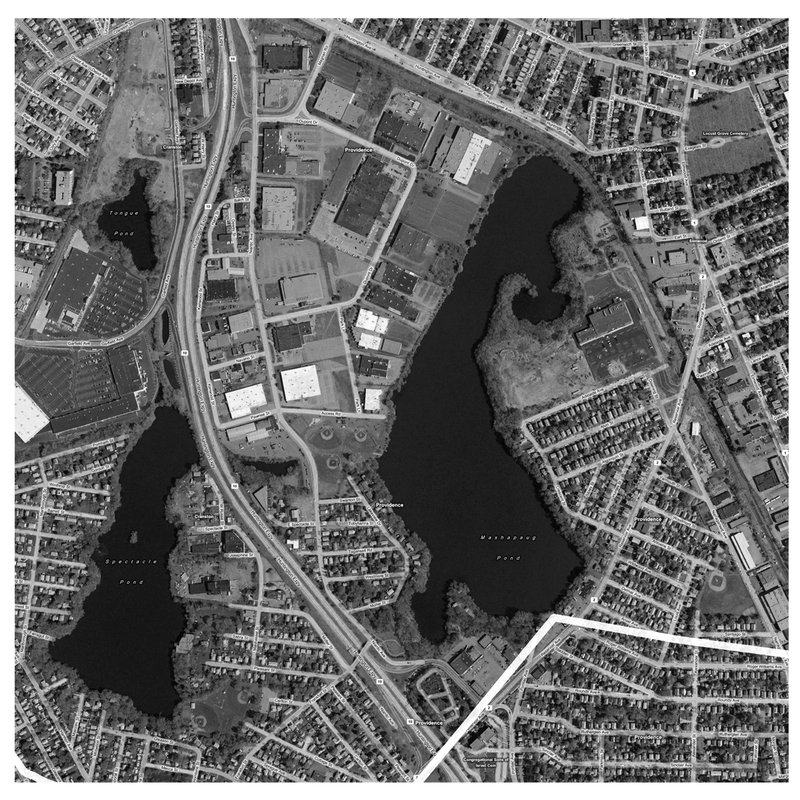 The Huntington Business Park, known locally as simply the industrial park, reshaped the entire northwest section of Mashapaug Pond. In the early 1960s, the city deemed the area “blighted,” and residents lost their homes and community. A sterile and flat landscape of commercial buildings replaced the rolling hills, fruit trees, and ample gardens cared for by homeowners in the ethnically diverse neighborhood “across the tracks.” These topographical changes and stormwater runoff in the extensively paved area have worsened pollution in the pond. Crescent Street and Lakeview neighborhoods hug the pond, too, giving some residents daily views of Mashapaug, even if pollution forces people to stay out of the water. Despite the environmental challenges it faces, Mashapaug Pond continues to connect many people who live nearby and care about the site. Its history represents the complicated relationships between city officials, commercial interests, and residents, especially communities of immigrants and people of color who have lived in the area for centuries. The churches, retail areas, parks, and baseball fields that surround the pond are sites of memory and sources of inspiration for people who know Mashapaug. This audio tour shares their stories and a hidden history of Mashapaug. I remember Mashapaug Pond very fondly,we lived down the street from it,we lived on Dexter St. closer to Potters ave. where Benedict Pond once was going down Dexter & Bucklin Sts.,Huntington Ave. was all we had to cross to enjoy good times there playing outside near the water,we never swam in it yet we did enjoy ice skating in the winter time. Before the neighbourhood was removed,it was country-like & so pretty,there were trees bearing fruit or simply looking their best everywhere,there were rolling little hills,the roads were mostly of dirt & all nestled in the middle of Providence. I do think often about all of the people who lived their yet weren`t totally aware of how polluted it was,i was thinking that maybe,the company was beginning to realize the amount of poison that had been going into this pond,how toxic it was,ppl. living there probably fished,swam & used that water without discretion because they were unaware of the real & true dangers,yet i believe that this company did know & truly wanted to avoid many lawsuits that would have arisen out of this,so they all planned together (with the city of course) & came up with this “blight” word they always used when they wanted to legally clear ppl. from a piece of land & i truly believe this “is” exactly what they did back then. Not many mentions of the Native People who once inhabited this very pond & area,it seems that “all” of that past history has almost been forgotten & this is truly a shame because not many are aware of the “true & real” history Native Americans have had here at Mashapaug or “Mash,” as it was sometimes referred to in slang when telling someone where you were going,you`d say,”i`m going to Mash for a bit.” Truly is a shame because they have taken away “Long Pond,” & “Benedict Pond,” as well as “The Duck Pond (Bucklin St.”) & other small ponds that were here of which i knew one in the early 60`s that sat behind Sackett Street & in back of the Narragansett Electric Company at Cadillac Drive in Providence,it now contains bldgs.,streets,& recreation parks that were never there,it was all woodlands yet is now changed.